Takeaways from Episode Three ~ No Limits on Learning! As I mentioned at the end of this post, my work team and I host a podcast called Digital Learning Radio. In our podcast, we discuss ideas for implementing technology, interview guests, and share some of our favorite things. This year, we are working our way through the ISTE Educator Standards, and we're talking to leaders in the field as we take a deep-dive into each one of the standards. For Standard 4, Collaborator, we had the privilege of interviewing Gary Hirsch, who is a Portland artist, botjoy creator, and co-founder of On Your Feet. I shared how I discovered his work in this post about Joy Bots, but participating in this conversation with him was one of the highlights of my year! 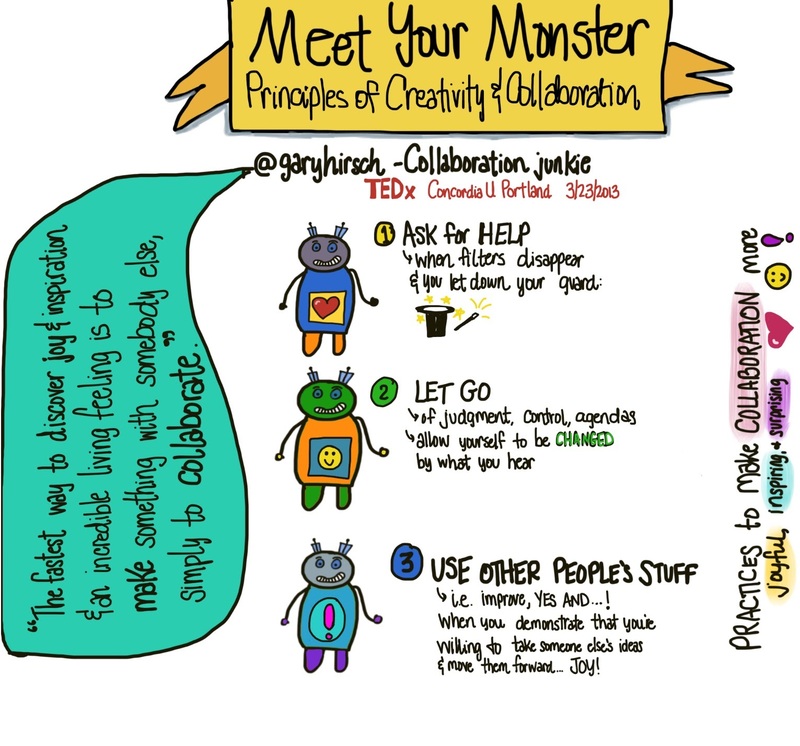 I originally created this sketchnote for Gary's TEDx talk, which is all about the power of collaboration...and it's what prompted us to reach out to him to discuss ISTE Educator Standard 4. After posting these sketches, I decided to really take a risk, so I sketched one of my favorite quotes from this episode. I also created a sketchnote of 5 of my favorite takeaways from our conversation. Listen to the entire episode here, and enjoy. I'm always learning...and thanks to this inspiring interview, I'm learning to take more risks!